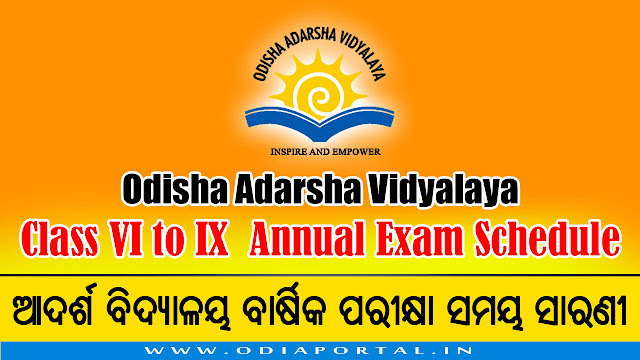 The following is the official Time Table or Schedule of Upcoming Annual Examination 2018 of All 160 Odisha Adarsha Vidyalayas situated in Odisha. The programme (time table) for Annual Exam.,2018 of Std. VI to IX and instruction for supply of question papers for annual exam, 2018 is sent to you for the readiness of the students. The question papers will be sent to all vidyalays just before 5 days of the commencement of examination through exam email-id i.e. [email protected]. Further the Principals/ exam-in-charges are requested to contact this office over phone (0674-2300336/9861373653/9439708019) in order to obtain the password of exam email-id for downloading required no. of question photo copies. A responsible Asst. teacher of the OAV may be designated as in-charge of examination to look after the conduct of examination. All formalities as per examination conduct rules may be maintained for the secrecy of question papers. This shall be treated as the most urgent. TIMING 7.30 A.M. to 10 A.M.
1st Sitting - 7.30.A.M. to 10 A.M. Schedule of the examination shall not be deviated in any circumstances.